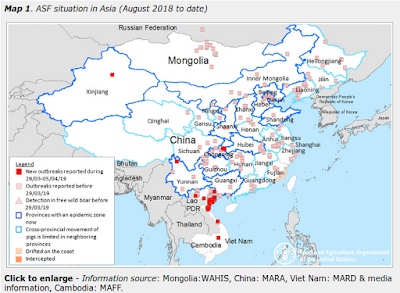 We get avian flu information out of China in piecemeal fashion, with some provinces announcing cases when they occur, and others burying that information in End Of Month epidemiological reports. Sometimes, as with the four H9N2 cases announced earlier this month, the data is several months old before we hear about it. Jiangxi Provincial Health and Family Planning Commission on December 31 briefing, Jiangxi confirmed one case of H7N9 cases. Currently, patients with stable vital signs, Ganzhou is a hospital for treatment. Patients with Chen, male, 46 years old, live in Ganzhou Anyuan County. December 30, Jiangxi Province Center for Disease Control and Prevention in Ganzhou patient specimens are sent for review, and identified as H7N9 virus nucleic acid positive. Provincial Family Planning Commission Expert Group Health patients according to clinical manifestations, laboratory tests and epidemiological findings, etc., diagnose the patient with H7N9 cases. This is the first report of H7N9 out of Jiangxi Province this fall, and only the 11th overall case reported from that province (ranked #8 in number of cases in Mainland China). The following chart from Hong Kong's CHP lists all known H7N9 cases by province. The actual number of H7N9 cases in China is not known, as only those sick enough to report to a hospital, and have tests run, are ever identified. Like most viral illnesses, H7N9 can produce a wide range of illness, and we've seen evidence of both mild and aysmptomatic infection. The fact that only a few small family clusters have been documented, and we haven’t seen evidence of ongoing transmission among the close contacts of known cases, strongly suggests virus does not yet possess the ability to transmit efficiently between humans. Which is why we watch these outbreaks in China carefully, looking for any signs that the behavior of this virus is changing.